With the Clyde nuclear spill in the news, it seems that British nuclear facilities in Scotland are under the spotlight once again. This goes for the British nuclear submarine fleet too, especially now since Bob Ainsworth announced in May that the entire fleet would soon be moved to Scotland. So what are the options for the rump-UK government and its nuclear submarine fleet, once Scottish re-independence is achieved? 3. Negotiate to rent the old deep-water lochs from Scotland for an appropriate fee. The al-Megrahi case clearly showed how much the mighty UK Govt can still force the parochial Scottish Govt's hand on Big Issues. I’m sure for a consideration they can be brought to heel for some kind of mutually beneficial arrangement. 4. 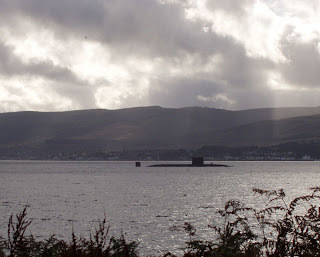 Let’s face it, the nuclear subs were kept in the west of Scotland to keep any attack/meltdown away from London, to disguise their comings and goings in deep water, and to give them Atlantic-facing harbours. Belfast and Plymouth could play host [if the locals are obliging] but Sunderland and Newcastle are facing the wrong way. Fortunately, you are still fighting the Cold War, so this may not be a problem. 5. Rent harborage from Iceland. Oops, hang on. Scratch that. Like the Black Sea Fleet they'll hang around for generations. That's probably the sad truth. Hey - we could even get our very own Gitmo! Maybe even our own Bay of Pigs.